Well, here we go again. Vampire fugitive Barnabas Collins — on the run, and spending his days sleeping in a cave, apparently — pirouettes into his secret headquarters at the old rectory, and tells his friend Julia — who has recently channeled the zeitgeist in order to travel back in time and help him — that they have to change their plans to defeat the mad old wizard who’s threatening the future of the Collins family, and all of the people that he loves. Why? Because he just ran into somebody who reminds him of Josette. That’s why. It’s maddening, and just imagine how Julia feels. She came all the way here from the 20th century for this. 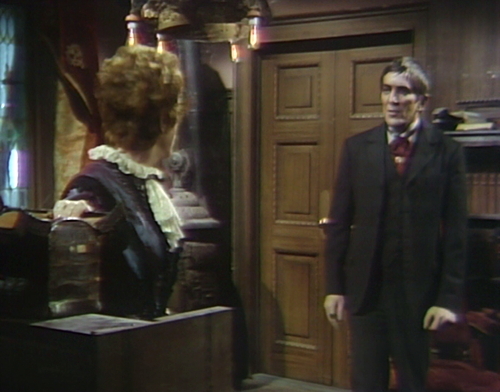 Barnabas is the one who convinced her that they need to stay in this time so they can counter the wicked Count Petofi, and now, quelle surprise, he’s going off-script. He was just out rambling around in the woods, like he shouldn’t be, when all of a sudden who should come along but Lady Hampshire, a brand-new character who’s played by the same actress that played his long-lost love a couple years ago, and therefore she is the actual reincarnation of Josette, according to rules that only seem to apply to this specific instance. And you know how Barnabas gets, when he thinks he’s found a reincarnation. This is his third consecutive swing at that particular plot-point piñata, and it’ll probably end the same way, with gunfire. You know, I’m starting to see Count Petofi’s point. Barnabas Collins must die. So here’s Barnabas in the rectory, where Julia is preparing one of her anti-vampire injections, and he’s just giddy, pacing around the room. Julia asks if something’s happened tonight, and he delivers the big news. Julia goes through several stages of unthrilled, all in a row. She tells him it’s not Josette, but he insists that it is. He floats around the room, chirping, “It’s as if I were back in time again,” to which Julia says, Dude, you already are back in time. That’s where we currently are right now, back in time! We’re as much back as we need to be; going more back is counter-productive. But try explaining anything to Barnabas. So if somebody’s killing Barnabas today — and I regret to say, somebody is — then the prime suspect is clearly Dr. Julia Hoffman, and the murder will take place in the next thirty seconds. I mean, look at her face. That’s someone who’s about to jab a needle into your arm. Barnabas sure knows how to live dangerously, even for a dead guy. The really frustrating thing is that we were just getting somewhere really exciting. Count Petofi’s been encroaching on the soul of dreamy teen hearthrob Quentin Collins, so Barnabas hatched a secret scheme with his pals Julia and Angelique, to retrieve Quentin from the Count’s clutches. That sentence included the names of five all-time Dark Shadows rock stars, so obviously this is an unbeatable storyline that demands our immediate attention. So now he wants to bail on the plan, before we even know what it is yet? Not acceptable. The question on the table today is: Do we actually need a Barnabas? If we already have villains and vixens and tortured hearthrobs, which we do, in abundance, then why are we paying a protagonist’s salary to a guy who can’t stay focused on whatever scrap of a storyline he has left? So Barnabas sashays over to Collinwood, where he is not allowed to even be, and he gives Quentin the stop-press news that there’s a girl that he likes. Barnabas asks for Quentin’s help, and Quentin says, “Barnabas, how can I help you?” except he says it like “How can — (choke) — I — ‘help’ you?” and then he makes bonus eyebrow movements. Quentin’s always somewhere on the “tortured” index, but today even more so, because Count Petofi is pressuring him to turn on his friends, specifically the one he’s talking to right now. So Quentin is indicating that he’s troubled by this, and he’s not doing it in a particularly subtle way. 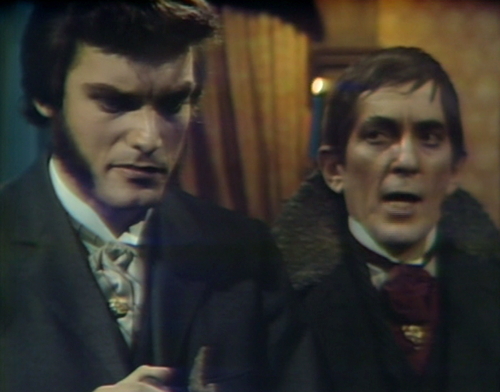 That’s fine with me, because Dark Shadows has taught me that subtlety is overrated, but Quentin is currently broadcasting discomfort on all frequencies, and Barnabas is not even paying attention. Now, the reason why they’re keeping the secret plan secret is that they suspect that Quentin may be giving information to Petofi, and this is exactly the information that the secret plan is secretly planned to protect. This is why Julia was so upset a minute ago, when he said he was screwing with the plan. Barnabas is terrible at everything. Later on, Julia comes to Collinwood to see Quentin and just knocks on the door, even though she’s trying to hide from pretty much everybody here. Apparently, in 1897, being on the lam is conducted entirely on the honor system. She knows that Barnabas talked to Quentin about Kitty, and she wants Quentin to do the opposite of whatever Barnabas said. Her advice: Yawn and look at your watch a lot, and ask what she’s planning to do after her visit is over. Maybe leave some bus schedules lying around. He says no, of course he doesn’t, but the question hits home — and after Julia leaves, Quentin still hears her voice, challenging him: I don’t want anything to happen to Barnabas Collins. Do you? Do you? Do you??? The correct answer to that question is: Yes, of course we want things to happen to Barnabas Collins. This is a soap opera, we want things to happen to everybody. Preferably, terrible things, punctuated with weddings. That’s how this genre works. So that’s the argument for the prosecution. If the steps to audience approval are make a friend, make a joke, and make a plot point happen, then Barnabas is currently doing the opposite. He’s tearing his friends apart, he’s being overly serious about a ridiculous idea, and worst of all, he’s bringing plot points to a screeching halt. Barnabas Collins has got to be stopped, and this time I mean it. To be honest, he’s been asking for this for a while. Barnabas was released from his vampire curse back in 1969, but he became a vampire again when he started this 1897 time trip, and he’s been here for six and a half months. This is approaching his previous all-time record from 1967, when he was a vampire for seven months. This appears to be the hard limit on the amount of time Dark Shadows is able to commit to a vampire protagonist. Because it turns out that from a narrative point of view, a vampire is a big investment. He can’t appear in daytime scenes, which means everybody else needs to timeshift in order to have a conversation with him. Also, every once in a while you have to let him kill somebody, because otherwise he’s essentially pointless and a net liability. As the cast dwindles, if everybody stays clueless about him being a vampire, then you have to start reducing IQ points — but if everybody finds out that he’s a vampire, as they have in 1897, then that means he has to go hide in a cave, and then you have a main character who’s not allowed to be in scenes with almost anybody else on the show. In open-ended serialized narrative, a vampire is an unstable character type — somebody who ultimately causes more story problems than he solves. 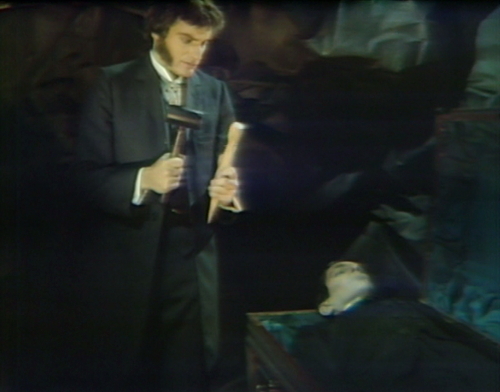 The writers planned for Barnabas to have a little exciting “vampire hunt” sequence as they were heading for the conclusion of the 1897 storyline, but then they decided to extend the time trip for a while. Barnabas has been on the run for almost three months now, which means he’s basically radioactive. He may think that he’s going to start a romance with Kitty, but it’s only a matter of time before somebody tells her that he’s a vampire, and then what? This is why all the other vampires on the show get staked, before they do too much damage to the story structure. Tom, Dirk, Megan and Roxanne probably get a couple weeks each; Angelique’s vampire phase lasted a little bit longer than average, but then she just disappeared from the show, while we were all thinking about something else. 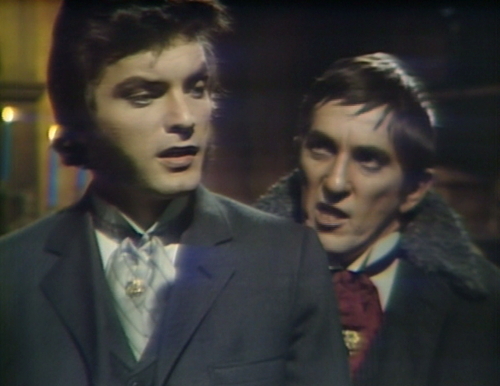 To keep Barnabas on the show, they have to shuffle him back and forth between vampire and human, to a point where it seems almost haphazard. So they’re wrestling, as always, with the idea of a permanent vampire protagonist. So if they’re going to do this — if they’re actually going to drive a stake through the guy’s heart, and they are — then the only solution is to have Quentin do it. This is his story, after all — Barnabas is just a weird intruder, who wanted to help but ultimately didn’t really accomplish very much after all. Quentin is a monster too, but he’s in remission, and anyway, his monster side only shows up two nights a month, which is adorable. Narratively, it’s not that hard to accommodate a werewolf on a continuing soap opera, which is why pretty much every soap opera that’s currently on the air has at least one werewolf in the main cast. Quentin is the new teen dream, and he’s taken over as the protagonist anyway, so yeah, this story point really only makes sense if Quentin is the guy with the hammer. That’s why they don’t do it that way, because what’s the use of Dark Shadows if it makes sense? So Quentin taps out, and in his place, here’s Pansy “Charity Trask” Faye, an insane woman who’s possessed by the spirit of a different insane woman. She follows Quentin to the cave, wearing an enormous hot pink feather boa, on account of stealth. And when an anguished Quentin throws the hammer and stake to the ground, she picks them up and starts making executive decisions. So there you have it. For months now, Pansy has been offering to dance our cares away, and here she is, finally delivering on that promise. Barnabas Collins is dead. I mean, he always was, but even more than usual. In her first scene with Barnabas, Julia looks at the teleprompter before delivering every line. In act 2, there’s an unusual edit between the scene in Quentin’s room and Julia knocking on the front door. The edit makes it look like Quentin just teleported downstairs into the drawing room. Charity asks if Quentin knows what happened three months ago, tonight. She’s talking about Carl’s murder, and she has the dates right. 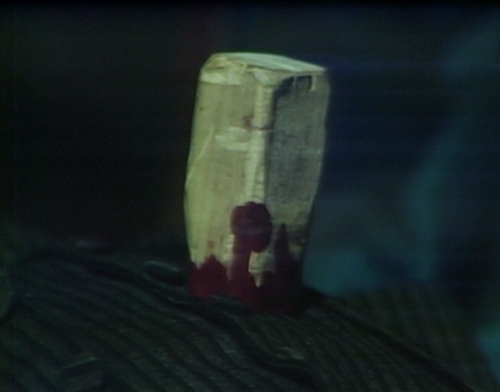 Barnabas killed Carl during the evening of episodes 779 and 780, which aired on June 19th and 20th. Today’s episode airs on September 19th. The last thing the show needed was yet another Josette lookalike storyline. They already had one with Rachael a few months ago. A lot of fans were fed up with this and one wrote in to a fan magazine complaining. This was different in that Kitty actually was Josette reincarnated. The recurring theme with this is the bringing together and then separating of the two lovers making it a timeless story. Now, I would like to have anyone’s take on this big plan that Barnabas had hatched up with Julia and assisted by Angelique. Obviously part of it was to have the “vampire” to be destroyed and then Barn “cured” by Julia would reemerge into the story. But…how does that on its own defeat Petofi? Was there something I missed? The problem is that Frid and KLS didn’t have great chemistry, so I was never that thrilled to see them together. Later, when there is an attempt to pair 1970 Maggie and Barnabas, it falls flat because they have so little in common. 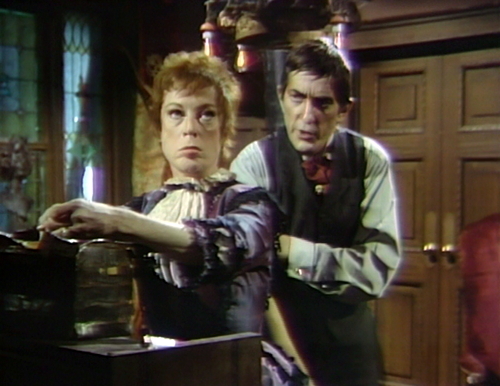 Vicki and Barnabas at least had their mutual interest in the past. Though also no chemistry to speak of. Yes, and it’s especially frustrating because Kitty was an interesting character in her own right before the Josette stuff happened. I would have loved to have seen more of her, and it seems like kls with having a good time playing a character so different from Maggie or Josette. I dunno. There’s something beautiful about lovers reuniting across time. I think Kitty was needed precisely because Rachel died. Dan called KLS back from her extended vacation to give the story the send-off they’d always envisioned. I know the accepted view – and mostly true – is that DS was created on the fly, but there’s something about the resolution to this story that convinces me that it actually was planned for some time: They always intended for Barnabas to find a Josette and thus a conduit back to his own time. Just as they always knew how Vicki would return to the present, they built in an escape hatch for Barnabas before sending him through the I-Ching door. If KLS had never gone on vacation, Rachel – who was involved in every story – would have continued as the heroine of 1897 and gone through that portrait. Kitty takes her place. Different Josette, same result. I shed a tear whenever Barnabas is briefly reunited with his Josette. Some of Jonathan’s best moments were those gentle romantic scenes with KLS. With Angelique distracted by Quentin right now, you can’t help but hope that maybe this time she’ll keep out of it and let DS’s Romeo and Juliet have 5 minutes of peace. I should reread the blog posts around this period, but it seems like the intent was to wrap up everything in 1897 with a 1795-Hamlet-style everyone dies pretty much ending. And there’s the vampire hunt to cap it off. So, sure, I guess, they could have gone down this path with Rachel and not Kitty but this wasn’t the path at the time when they were considering ending 1897. I don’t really have a clear idea of what the original ending would have been. The evidence is mostly around timing. The key moment is episode 778, when Magda brings the Hand to the Old House. The “3 steps to Quentin’s death” checklist is good evidence that the original plan was to bring Julianka back instead. Then Julianka would get killed, checking off step #2, and setting the stage for step #3. 778 is also the day that Carl discovers that Barnabas is a vampire, so that’s evidence that the vampire hunt would overlap with these final weeks of 1897. I think Mark makes a good point that Rachel may have been intended for a more pivotal role — she dies in 776, so that week is basically ground zero for all these changes. I don’t know if I agree with Mark about the intention to use Rachel as a conduit to send Barnabas home. At that time, Barnabas’ physical body was still sitting in the Old House basement, and he could have used the I Ching to send himself home. It’s only recently that that door seems to have closed, and now he needs a new way back to ’69. Do you think there was any thought about actually saving Quentin at this point? Unlike 1795, where the past isn’t really altered, it seems like preventing Quentin from dying is the best way to stop him from haunting Collinwood. I imagine building up the suspense factor for the 3rd event would dovetail nicely into Quentin’s possession of David in the present. Of course, Quentin was popular so 1897 is extended because, as we unfortunately discover later, he’s at his best in this time period. Was staking Barnabas a total surprise/shocker back then? Did they have Soap magazines like today where they teased his potential return, or gossiped that Jonathan Frid was leaving the show? I wonder if it was sort of like the summer of 1990 after the broadcast of Star Trek: The Next Generation episode “Best of Both Worlds” Part 1, where it was discussed in fan magazines whether or not Patrick Steward would return to the show in fall, after Capt. Picard was Borgified. I watched that episode when it originally aired at the ripe age of 9 and was quite shocked by it. Even watching it now on home video it is a little unsettling. I don’t recall reading anything about Frid leaving DS. In the Dark Shadows Companion written by KLS it is claimed that the ABC-TV switchboards in New York erupted with calls. Whether that really happened or not I of course have no idea and whether it was the violence or the shock of Barnabas dying again who knows…. The staking was a shock, but at that point, my sister and I were both jaded enough to think Barnabas just needed a vacation. We recognized he was too important to the show to be really offed. I’m going to get nostalgic any second for a time when the only way to consider a show was what was on the screen and by talking to your neighbors. No internet spoilers, no magazines. I watched the staking of Barnabas on a set in the TV Department of a department store where my Mother was shopping after school that day. I didn’t regard the staking as any big deal, as I’d been watching Dark Shadows long enough to know that it was meaningless when a character got killed. When I later heard about shocked fans allegedly calling the ABC switchboard, I wondered what series they had been watching the past couple of years if they thought Barnabas getting staked meant anything. Hadn’t Vampire Tom Jennings already gotten staked? All Nicholas Blair had to do to revive him was pull the stake back out. It’s awesome to hear how people actually experienced that moment. I remembered it as being a big deal when I first watched these episodes at age 15, but then I looked at my “Young Danny” DS notebook, and I didn’t write anything special about it. In the next episode’s entry, I wrote that “Charity killed Barnabas (or seemed to),” so obviously I was unfazed. I think the fan-switchboard calls are probably a result of the Beatlemania-style excitement encouraged by 16 Magazine. The kind of girl who freaked out when Frid visited a local shopping center would probably get worked up about this. Like Beatlemania, getting “hysterical” is a conscious choice that they’re making, because it’s fun to get that excited, especially if your friends are too. I am trying to figure out what a date with Jonathan Frid would be like. I guess bored housewives and crazy teenagers bought into it. I watched this episode when it originally aired and yes, I was really shocked. And yet, I knew that there was no way they were going to kill off the show’s most popular character. 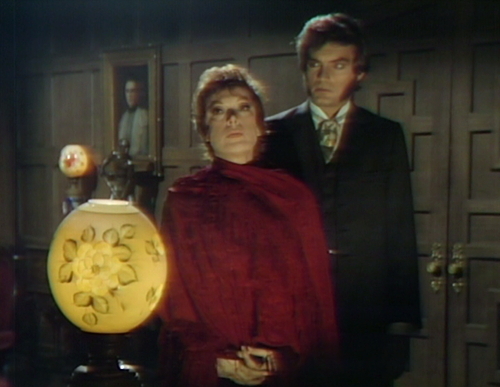 By this point in time, I realized that anything was possible on Dark Shadows. I knew Barnabas would somehow return. The question was: How? Oh, and back then, there were no soap magazines to list the “comings” and “goings” like there were in the 80s and onward. The regular entertainment magazines would have small sections about daytime TV soaps, but news was delayed. Dark Shadows was a hot topic in 16 Magazine, Tiger Beat, etc., and I think that they would be more likely to comment on Frid’s supposed departure, but they didn’t. Barnabas must remain on the show, because then what would Julia do? Julia’s whole purpose as a character is the secret(s) she shares with Barnabas. As a result of this pact, these two characters bridge worlds between time, and Dark Shadows, more so each year, will spend less and less time in the present, so that alliance must remain intact. They’re the soap opera equivalent of Shaggy and Scooby Doo — you can’t have one without the other. So perhaps that list of character essentials should be expanded to include one additional requirement: make a friend, make a joke, make a plot point happen, and keep a secret. For what it’s worth, Barnabas has never actually made a joke. Instead, he has an occasionally sardonic mannerism that more than makes up for it — like in 1967 when Barnabas informs Julia that Willie “continues to cling to life with a leech-like persistence” and then wonders how long it will be before Willie “makes a miraculous recovery and begins writing his memoirs”. Or when confronted at the Old House by Tony Peterson about that hug with Carolyn he witnessed and when Barnabas reacts with a sneer Peterson says that he doesn’t find it too amusing, and then Barnabas turns his back to him and with a dismissive grin tells him, “Then you shouldn’t go around being so amusing.” He has a certain mannerism, a striking presence, and great elocution of voice. Quite plainly, and no matter who else comes along, in the public consciousness, Barnabas has become the face of Dark Shadows. Ironically enough, it will be Frid himself who tires of Barnabas before the viewers ever would have. And that proved very unfortunate for Barnabas himself and the fans of dark shadows. Fun things happen, when Kitty meets Angelique. Oh yes, my favourite set of scenes between the two actresses! I suspect the original plan (had Quentin not become so extremely popular) would have been for Barnabas somehow to finagle Quentin not dying when and as he did (thereby presumably saving David) and getting cured of his curse (thereby presumably curing Chris). Barnabas could then return to the present, leaving Quentin in the past, never to appear again. But Quentin did become extremely popular, even to the point of seriously rivaling Barnabas in popularity, so they couldn’t just leave him in the past. So they had to figure out a way both to “unghost” him (saving David) and to have him continue alive and well in the present (thus Petofi and, especially, the portrait granting him perpetual youth). All that is sheer speculation, of course. Just in time for Easter, here’s Quentin calling himself “Judas!”. I guess Barnabas is kind of his “own personal savior”, come down from the future, only to be betrayed and nailed to a coffin, only to rise again, and save Quentin from himself! TA! DA! I see your point about vampires not belonging in serialized narrative. At least not the way they go with Barnabas, leaving dead bodies over the place. Sure, it is an attention grabber, and has a lot of chills. But it cannot last, and a serialized narrative needs storylines and characters that last and last. Which is why when you have vampires in serialized narratives (like in Kindred: The Embraced) they are non-lethal in their feeding. Basically they follow the Michael Westen rule “I do not want any homicide detective looking into my business” and the best way to keep homicide detectives away is by not giving them corpses (or disappearances) to investigate. When I saw this episode in 1969 I was shocked but fully expected Barnabas to return eventually. The reason is that I literally grew up watching soap operas — my earliest memories are of sitting on my grandma’s lap while she watched her ‘stories’ — and I knew better. Soap opera characters only die if the actor portraying them has died, unless their part is recast. Otherwise, characters are presumed dead because they have fallen into the ocean, or were involved in a fire or nasty accident, scenarios in which the body was not found, or little remained of the body to be identified. Or they were in a coma and their body was switched with another corpse, which is what I assumed happened to Barnabas. Or if they really did die, the actor would return as the twin sibling no one knew existed (see Jennings, Tom/Chris). On All My Children one character was cremated and still came back. And on the Guiding Light Reva must have come back from the dead at least 5 times. I really enjoyed the staking switcheroo. Quentin almost kills Barnabas – not surprising because stakus interruptus is pretty much par for the course, given that the audience doesn’t really think DS can kill off its vampire hero. But before you can yawn “been there, done that”, Charity/Pansy picks up the loose vampire exterminating equipment and does the deed! Gotcha! And Pansy has plenty of reason to want to stake the snake that killed her beloved Carl. Additionally, Pansy is a good choice because we don’t want to make Quentin too unlikable. Better to have the killer be someone who is possessed anyway. And …. on a topic that is not Barnabas’ staking, can I get a big round of applause for the way she reminded Barnabas that Josette was Just Not That Into Him? “The last time she saw you she committed suicide,” indeed! Julia, that is. Julia reminded Barnabas! Well Barnabas is hard headed. Julia has read him plenty of times about his trying to get women who dont want him and she is right every time. He comes crawling back to her having bitten off more than he could chew getting his ball busted time and time again. Not for nothing, but Nancy Barrett is the best actress on the show. She’s just amazing in every single role she plays, and Pansy Faye is a real pip! I enjoyed Carolyn as Latticia. She should have received a golden globe award for Pansy Faye. 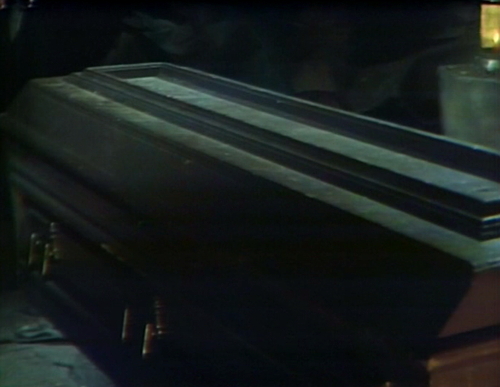 Pointing out (again) – Barnabas’ head cannot possibly be where it is if the coffin lid is to shut properly! perhaps there’s some mechanism (like a Craftmatic Adjustable Bed) that raises and lowers the corpse when the lid is opened or closed?